Beginning at sunset on the night of January 27, 2015 and continuing well into the night, volunteers from Lake County’s Continuum of Care agencies canvassed Lake County, as required by the federal government, to find the homeless where ever they might be. That night we found a total of 93 individuals, 64 sheltered and 29 unsheltered. The sheltered homeless, including all 19 homeless children, were being cared for at Project Hope, Lake County’s only emergency shelter, at Forbes House, our domestic violence shelter, in various transitional housing programs including Lifeline’s program and North Coast House. Additionally, several families were staying in local hotels, placed there temporarily by Job and Family Services and Extended Housing because there was no room for them in emergency shelter. Our County’s capacity for providing emergency shelter to all who need it is severely limited. 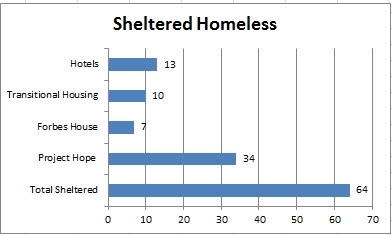 Project Hope is planning to add 15 beds in 2015 and has designated those beds specifically for families with children, but clearly we are unable to shelter all of our county’s homeless on any given night even with this additional capacity. As a result many of the homeless are left to find shelter on their own, usually by “couch surfing” at a friend’s place, or without any other options, are left unsheltered. On the night of the Count, volunteers found 29 individuals who were considered unsheltered – staying in a place not meant for human habitation. St Mary’s Church in Painesville, as they had done during the bitter cold winter days in 2014, again this year provided an over-night warming center for 18 of those individuals without shelter. The rest were found sleeping in their cars, tents or on the street. Eight of these unsheltered homeless are considered chronically homeless and have been homeless for an average of 4.1 years. 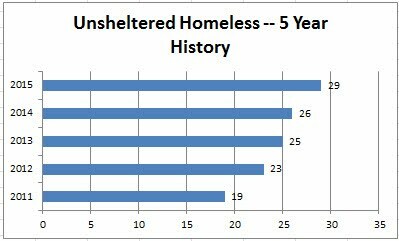 Our data show that the number of unsheltered homeless in Lake County has been growing each year. As our Point in Time Count volunteers interviewed each of the 29 individuals on the night of the Count, we found we “knew” many of them. Most are seriously mentally ill, avoiding treatment, and have been in and out of our shelters and/or housing programs in the past. Because of their conditions, they are unable to maintain the behavior/sobriety requirements in place at Project Hope for the Homeless and are often very wary of any interventions we might offer. The St. Mary Warming Center provided 18 unsheltered individuals a safe haven from the single digit temperatures that night, most likely saving their lives since few were equipped to weather such severe winter conditions. The 2 individuals who told us they would be sleeping on the streets that night refused our offers of taxi transportation to the warming center and our suggestions that a local Walmart, which was within a ½ mile of their location and open 24 hours, would allow them to stay warm overnight. 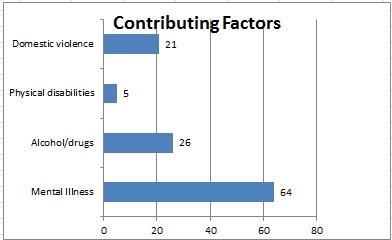 The 74 homeless adults identified on the night of the Count indicated that one or more factors contributed to their becoming homeless with 86% acknowledging mental illness as the primary factor. The Lake County Continuum of Care is a cooperative organization of government agencies, non-profit service organizations and churches charged with the responsibility of identifying the basic root causes of homelessness and developing the programs and methods required to better support the needs of the homeless and those who are on the verge of becoming homeless. It is part of Ohio’s Balance of State Continuum of Care, Region 5 which includes Ashtabula, Geauga, Portage and Trumbull counties. Each year the Continuum is responsible for coordinating the annual Point in Time Count of the Homeless as required by the U.S. Department of Housing and Urban Development (HUD). This year our volunteers counted the homeless as they came for supper at the Karpos meals offered at St. James Church in Painesville and the Free Community Meal served at Willow Praise Church in Eastlake. 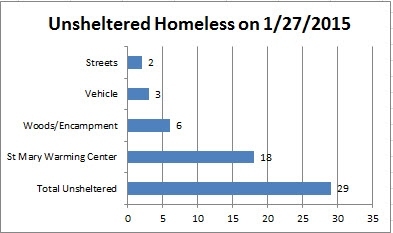 We searched throughout the county and found homeless individuals in parking lots, on the streets and in encampments. We recognize the limitations associated with trying to conduct a physical count of the homeless in the middle of winter. Conversations with individuals who were formerly homeless tell us that many homeless would be hesitant to leave a safe evening sleeping spot on such a cold night and, thus, would not have been counted. 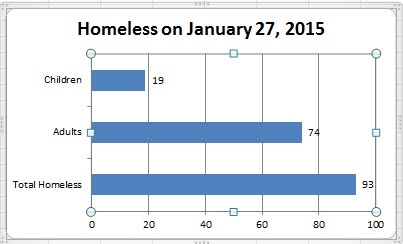 But despite its limitations, this Point-in-Time Count, completed on January 27, 2015, provides information Continuum agencies can use to assess our progress in reducing the number of unsheltered homeless and it also helps to ensure a better understanding of how many households may need our homelessness prevention efforts in the future. HUD’s definition of homeless is very strict. It includes only those who are living in places not suitable for human habitation or living in emergency shelters and institutional transitional housing. The numbers displayed above reflect those individuals who met HUD’s definition on the night of the 2015 Point in Time Count. · Were living with family or friends due to a lack of resources. This broader count confirmed what we had long suspected: the official Point in Time Count of the homeless under reported the number of people who were either truly homeless or soon to be homeless. Data from our county’s emergency shelter indicate those individuals and families who entered an institution as homeless or are living doubled up with family or friends are most at risk of entering the emergency shelter system. Thus using this expanded definition better reflects the entire homeless population of Lake County and allows the Continuum to understand the potential demand for services, effectively direct resources, establish secure housing and prevent households from ever living on the street. Knowing who are the homeless today and how many could be homeless tomorrow helps our community plan better ways to allocate precious resources.